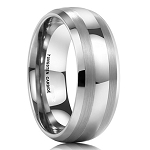 This timeless 8mm Classic style tungsten ring is sure to get many compliments! Bold and pristine would be just a few ways to describe this ring. 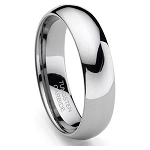 This Classic Tungsten ring also comes in a 2mm, 3mm, 5mm and 6mm. Yes. Although it is not shown on this photo, this ring does have the 'Tungsten Carbide' stamp inside the ring. Was this answer helpful? 27 of 30 Customer(s) found this Answer helpful. Q: how do you find out your ring size? You can use our online size chart or go to a local store and have it done. It only takes a few seconds to have them do it. Order the size they tell you and you will be fine. Another little trick, this is for men, Your shoe size is going to be very close, if not the same as your ring size. If you are a size 10 shoe, order a size 10 ring. I hope this helps! Was this answer helpful? 16 of 25 Customer(s) found this Answer helpful. Q: Are your rings "comfort fit"? A: My dad's had his for a few years and is a general contractor and has not made a scratch, I would like to assume yes, it does. Q: Can the ring be exchanged if it’s the wrong size? Q: This ring is plain correct? Does it have a design on it? Q: Is this ring totally polished? Is it plain or does it have any pattern or design on it? How does the sizing run compared to gold? Q: How thick is this ring? This ring is 2.5mm thick. Delivery in a couple days after ordering. 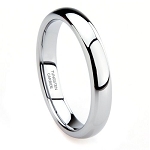 Great looking ring at an exceptional price, Fits perfectly. Highly recommend. Website was incredibly easy to use. The company allows for no-risk money back or exchange within 30 days. That is AWESOME. Didn't return mine as it was perfect. It was a great experience and I've already recommended the site to a group of my friends. I will be back!!!! Impressed with quality and feel on this ring. Looks great on my finger. Great ring, second purchase and I missed on the size and they sent the wrong ring. Gave a call, the ring was replaced immediately, and arrived promptly on the second day. I will definitely consider more of these. I love my new Tungsten ring. It fits perfectly and I am happy that it is scratch proof. I received in a prompt manner. I may buy another. 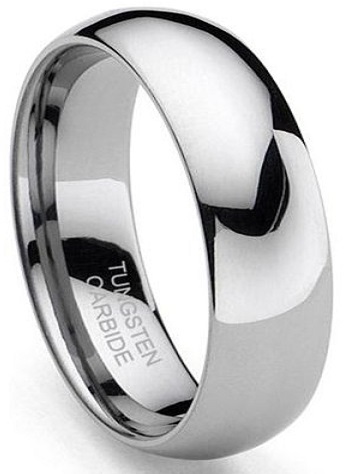 I would recommend this to my friends as a great wedding band. I am very happy with your products and ease of purchase. THIS RING WAS TOO TIGHT ON ME BY 1/2 SIZE. I ORDERED THE NEXT SIZE UP AND THE NEW RING WAS GOTTEN WITH NO PROBLEMS. IT IS VERY COMFORTABLE AND I'M SURE IT WAS LAST FOR DECADES. This ring is awesome. But the size seems to be small. I ordered an 8.5 and seems to fit like an 8. I am having a jeweler check the size. I may have to return the item for a larger size. But this is a great ring. Very nice ring. Would definetly recommend ordering from this company. Quality product and quick delivery. I ordered this ring without even reading reviews but then thought what was I thinking for doing that? I received this ring in a very timely manner and it's not just an ok ring. It's very comfortable,durable, heavy, scratch resistant and everything I wanted! size was perfect. We both LOVE this ring & for the price, I'd buy more! Expensive jewelers want $300+ for a ring just like this. I'd highly recommend everyone to skip the jewelers and go to tungsten fashions for sure! I would highly recommend this company. Product quality is excellent as well as response and shipping time. We bought this ring and a matching smaller one for our wedding bands and we absolutely love them! Great price, super fast shipping and excellent product. Beautiful and very smooth, simplistic but that is what I like. He won't be home until February, we'll see what he thinks. I would definitely recommend this site to everyone I know. Wonderful work!! I got this ring for my fiance and he absolutely loves it. He said it was just what he wanted. It's been so hard for me to find a ring to fit him because of his size, this ring fits him perfectly not too tight and not too loose!